One of Ethiopia’s most senior judges, Teshale Aberra, has left the country following “continued harassment” from the government, he has told the BBC.The Oromia region Supreme Court president accused the government of Prime Minister Meles Zenawi of killing its critics. He also said the government was planning to appoint new, loyalist judges throughout the system. 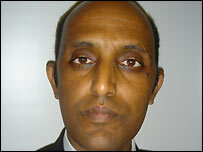 Mr Meles had been seen as being part of a new generation of African leaders. Mr Teshale is the latest in a series of senior officials – judges, diplomats and military commanders – to flee the country. He says he plans to seek asylum in the UK. The Ethiopian Ministry of Foreign Affairs say they have no reaction to the defection. 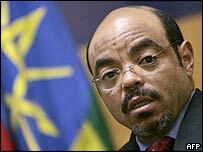 He told the BBC’s Focus on Africa programme that Mr Meles’ government was just as bad as that of its predecessor, led by Mengistu Haile Mariam, who is accused of crimes against humanity. Another judge, Wolde-Michael Meshesha, recently fled the country after carrying out an investigation into the suppression of protests against alleged fraud in last year’s elections.In his report, he said the police had massacred 193 people. His report said that the government had concealed the true extent of deaths at the hands of the police. The government has denied rigging the polls and blames the opposition for the violence which followed. In Ethiopia, the trial of 111 opposition leaders, journalists and human rights activists accused of treason and attempted genocide, who were rounded up during the protests, has been adjourned for three days after two defendants complained of mistreatment in custody. Daniel Bekele and Netsannet Demissie, who work for the NGO Action Aid, said they were neither “physically nor psychologically” able to go on with the trial because of the conditions they were being held in. Daniel Bekele told the court in Kaliti, just outside the capital, that he had been taken out of his prison cell on Friday night and forced to sleep in a container. He said the next day he was moved to a room with 250 inmates. Netsannet Demissie told the court he had been forced to sleep under one of the guards watch towers on Friday before being moved to a room shared by 300 defendants. Last year, Mr Meles was invited onto the panel of the UK’s Commission for Africa to find ways of relieving poverty in the world poorest continent. The Ethiopian foreign ministry advises us that Mr Teshale was President of the Supreme Court in Oromia region, rather than at a federal level, as we initially reported.